“Okay” I said taking the bundle from his hands. 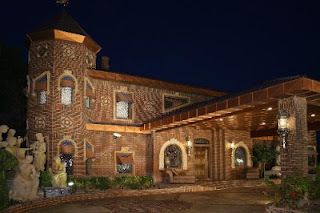 It was an invitation to a party at one of the wealthiest family in town; I was surprised to see the invitation as I had no contact with Singh family being from a small business family. None the less I was intrigued by the invitation and was eager to attend the party and since it was a Sunday and party was today and my schedule was free too. So there we were, in our car driving on Singh’s drive way, the path was beautiful all the way to their enormous mansion. There was a legion of cars in front of the gate and the valets were taking guests cars to move them to the parking. We also handed our cars key when we reached in front of the beautiful gate of the mansion. After a wait of almost half an hour we were finally walking inside that grand mansion, I just couldn’t stop admiring the décor and structure of the mansion. The atrium was quite huge and there were people as far as I could see but still the place didn’t seem crowded, it was amazing. Although there were so many people, I couldn’t find anyone I knew. This made me feel a little awkward and out of place and I thought maybe this wasn’t such a good idea. “Oh! Hello Mr. Singh, Beautiful home you have here.” I replied slightly surprised, how did he know my name? He did he was so rich and powerful. We were finally feeling a little at ease after talking to the host and seeing exactly how friendly he sounded despite being the richest man in the city. Still it made us feel strange and alienated among so many strange people. We started moving through the people to check different artwork placed throughout the main hall and throughout the entire mansion. It seemed like there were more paintings and statues here than a museum. It looked like that we would be stuck here for weeks checking all the artwork. It was truly magnificent, seeing all the works of art under this beautiful mansion or should I say Palace, it seemed apt I thought. The house was glowing under perfect lighting which was high lighting all the intricate details of the house increasing its beauty. That is why it felt very strange when we came across a dimly lit room while walking through the house. Curiosity got the better of us we walked as if hypnotized by the half dark room, and we walked inside. The walls of the room were lined with different cages and glass boxes filled with all kinds of snakes and reptilian creatures. We were shocked beyond belief were we still in the same house or did we walk up to a zoo unconsciously but we were still in the house as apparent by the background noise. And sure enough just like the entire house the creatures in the room were again exotic and breathtaking to look at. Suddenly I noticed someone at the end of the room, finally someone whom I knew. I walked towards my friend Ravi. “You? What are you doing here all alone?” asked Ravi like he was startled to see me. Now it was my time to freak out, as I wondered where my wife went. I instinctively looked back but saw on one. Where did Tanu go? I thought. I was more perplexed than afraid. After all, she couldn’t be in any danger in this big house with so many people. May be she just went to get a drink or something. I turned again towards Ravi but I almost jumped as Ravi was no longer there and he didn’t walk by me. It was like the room swallowed him. This was pretty strange to tell you the truth. Since there was no one else in the room besides me it seemed very creepy to me all of a sudden. I started to exit the room but now the door was closed. It was like somebody was trying to play some game with me. I was annoyed at this attempt of unwanted games. I banged the door few times but got no response, I tried to hear the noises from outside but strangely I couldn’t hear anything, it was like I was the only person in the entire house. There was sound of the music or the sound of people talking. There was a faint light visible from below the gate but it didn’t look like the kind of lights we saw in the main hall. “Where am I?” I wondered loudly again smacking the door but to no avail. I felt like crying after banging the door like a madman for around half an hour. Finally I slumped against the door tired and the room appeared darker now and scary too I wasn’t able to see all the way through to the end and as everybody knows that everybody is scared of the dark. “If I am going to be stuck here for some time more, let me at least see the wonderful creatures.” I thought and walked towards the assortment of the cages and boxes but there were no longer those colorful creatures and its place were black poisonous snakes and other ugly creatures. Now I was positively struck by the all situation and how it made no sense at all. I again checked the cages but they were empty now, what the hell was happening. Was I dreaming or someone was still playing some sick game with me. But no one woke me up from the dream or no one came forward smiling and telling me that it was all fun and games. Suddenly I heard a sweeping noise and I turned and saw that the door was no longer there. There was something spooky going on. I walked outside the room glad to be free of the reptile room but when I took a last look at the room it was empty of all the boxes and cages and it was just a dark room nothing else. I walked out of the room but instead of reaching that grand hall I left behind I reached a very big dark room. Everything was charcoal black as if burned and there was nobody to be seen. I stumbled out of that hall to escape the gloominess of the entire scene. But I again reached another charred remains of a garden it looked that everything was burned to the ground. I was standing in front of the mansion but although it was big it wasn’t grand as burned things are not grand and it certainly was burned all right. Was I hallucinating or something I remembered correctly that I did come to the party but how can things change so drastically. “So IT WAS A JOKE.” I thought with relief. “Hey where did everybody from the party go and what happened to the mansion and is this an illusion.” I asked the crowd. They look startled for a moment, and then they surrounded me. “Hey what do you think you are doing? You can take my wallet and watch.” I said but I wasn’t wearing a watch when I checked and I had no wallet just a dirty Kurta Pajama. “Are they trying to kidnap me?” I thought. “Poor Mr. Singh lost his family and everything in the fire which consumed his mind and his whole personality. He has been hallucinating like this ever since.” I heard someone say before I drifted into sleep following an injection. Sweet dreams! What a party! i already told u this..but lemme say it again..lovely post!! I must say that the words and sentiments are beautifully weaved which made this post interesting. Kindly make the font a bit bigger in size at least arial 12px so that its easier to read. Thanks Tushar will do buddy.